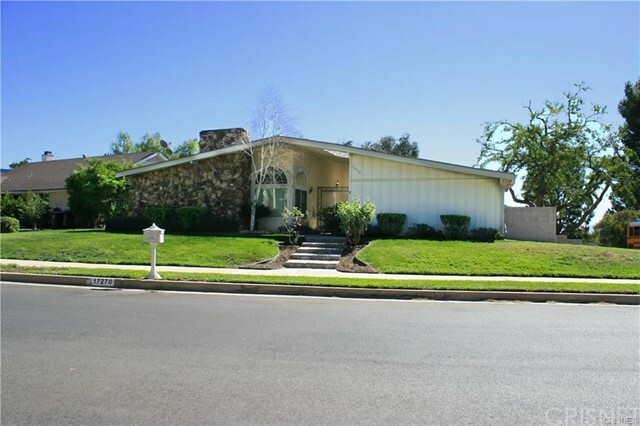 Sensational Granada Hills Single Story, North of Rinaldi Home for Lease in the Highly Desirable School District of El Oro Charter Elementary and Granada Hill Charter High School! Expansive Corner Lot with Gated Courtyard Entry and a Relaxing Rear Yard with Covered Patio and a Nice Lawn Area. Interior is Highlighted by Designer Wood Look Flooring, Soaring Vaulted Ceilings, Step-Down Living Room with Cozy Fireplace and Plantation Shutters, Entry Area could be Dining Area or Sitting Room, Spacious and Light Filled Kitchen with Breakfast Bar and Area, Granite Center Island, Oven and Built-in 5 Burner Range with Grill and Tons of Cabinet Space plus French Sliders to the Rear Yard. Separate Master Suite with Vaulted Ceiling, Large Walk-in Closet and Private Full Bath with Dual Sinks, Spa Tub and Shower Stall. Secondary Bedrooms with Full Hall Bath and another Door to Rear Grounds. Additional Amenities Include: Central Air & Heat, Smooth Ceilings, Recessed Lighting, and a 2 Car Garage.